Christmas dinner is a wonderful time to gather with family and friends and to reflect on the joy and gratitude of the giving season. You can use this time to share the Gospel story of Jesus Christ and to guide the hearts of those gathered toward the real reason for the season. If you are hosting the Christmas dinner, you have been given an incredible opportunity to celebrate the birth of Jesus and to tell your family and friends about the gift of eternal salvation. As you pause to give thanks, use one of these beautiful Christmas dinner prayers before sharing a delicious meal together. Father, we praise You for the Christmas season, and the remembrance of Jesus’ glorious birth! You remind us in Isaiah of the powerful namesake that came to earth for us. He could not be described by just one name or in one way …yet, He is the One who holds the key to our peace and our freedom. Thank You for setting Him here to pursue us. Thank You for the traditions that we treasure enough to miss, and those that we are blessed to continue celebrating. Forgive us for revolving Christmas around anything but Jesus. Unearth the routines that threaten to trip us in pursuit of You, and open our eyes to recognize what matters the most. Be with us this Christmas, Jesus. Open our eyes and our hearts to see you in a fresh, new way, whether in the midst of time-honored traditions or fresh new ways to celebrate Your birth. In Jesus' name, Amen. Father, Praise You for friendship and family! Thank You for bringing us together on Christmas day to share a meal. The people in our lives bring us such joy, and we are grateful for time spent in fellowship together. Thank you for the birth of your son and the gift of eternal salvation that He brings. Father, today we celebrate the reality of Your presence in our lives. We celebrate Your birth, Your life, Your death, and Your resurrection. And as we celebrate, Lord, help us to be "God with skin on" to those in need around us. Open our eyes and let us see them as You see them! We love You. Happy birthday Jesus! In Jesus name, Amen. Help us to keep our focus first on Christ this season. Please forgive us for giving too much time and attention on other things. Help us to reflect again, on what Christmas is really all about. Thank you that you came to give new life, peace, hope, and joy. Thank you that your power is made perfect in our weakness. Help us to remember that the gift of Christ, Immanuel, is our greatest treasure, not just at Christmas, but for the whole year through. Fill us with your joy and the peace of your Spirit. Direct our hearts and minds towards you. Thank you for your reminder that both in seasons of celebration and in seasons of brokenness, you’re still with us. For you never leave us. Thank you for your daily powerful Presence in our lives, that we can be assured your heart is towards us, your eyes are over us, and your ears are open to our prayers. Thank you that you surround us with favor as with a shield, and we are safe in your care. We choose to press in close to you today…and keep you first in our hearts and lives. In Jesus' Name, Amen. Praise You for family. You have placed people in our lives on purpose, to love us in Your name and for us to love in Your honor. Christmas is a time to be focused on Your gift to us. You made us daughters and sons through Jesus’ death on the cross. He came to this earth as a tiny, vulnerable baby boy, and walked the very soil we walk in order to save our souls. Jesus, Prince of Peace, be present in our family rooms this Christmas. Be in our kitchens and seated at our tables. 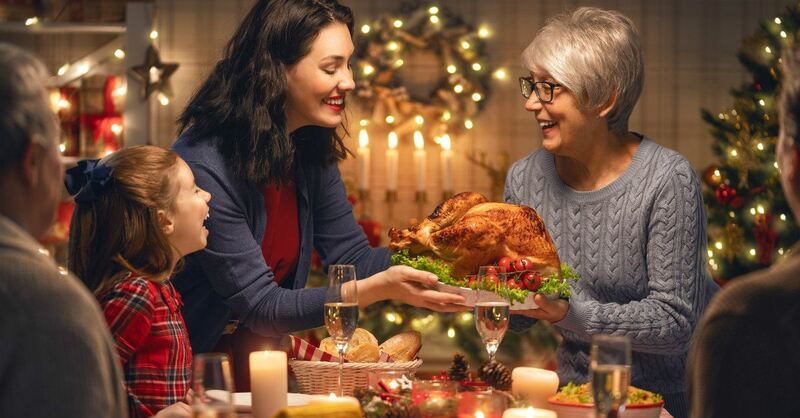 Fill the void of family members we have to let go of this Christmas, and fill our hearts with hope as we wait for our court-appointed hour to celebrate with them again. Our world is a mess, but there is hope because of Christmas. Matthew 1:23 assures us that God is with us through Jesus Christ. Thank You for our blended family. Though we are not perfect, You tell us not to worry, and assure us that no one is (Romans 3:23). Thank You for giving us people to share Christmas with and call family; for blessing us immensely, with new life and new hope, when we thought we had lost it all and blown all chances of a blessed life. Your nature is to forgive and restore, and we thank You for Your perfect love in that regard. Christ was never afraid to befriend those who were not living “perfect” lives. Help us to walk behind You, Lord, in search of those coming through similar situations that need the wisdom You have granted us. Show us how to reach out and help others that are struggling through situations that we have survived. For we know that in giving ourselves in Your honor, we will experience Your peace and presents. Bless this Christmas, bless our family and bless this meal together. In Jesus' name, Amen. May your Christmas dinner be blessed by love, laughter, and hearts filled with thankfulness, and may your New Year be filled with the hope and peace of God!